A thin overlay topping was poured, then it was stained to create the various colors. Saw cuts were placed to create a large-tiled-look and random squares were stained darker than the others. 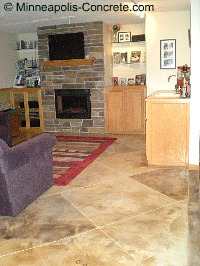 The picture below shows a stamped concrete basement. This is done by stamping a pattern into colored concrete while it's still wet. If the basement has already been poured (existing construction), a thin coating of concrete may be poured over the current concrete and then stamped. This is called a concrete overlay. Repair - Before staining or overlays, an existing floor with cracks, chips or other damage to it must be repaired first. 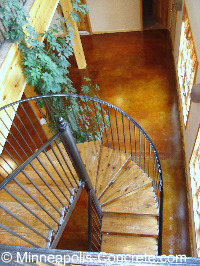 Sealing - After concrete has been colored or stained, apply a concrete floor sealer as a protector and to lock in the color and shine. 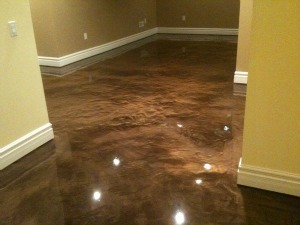 Shiny Floors - Apply a floor wax to increase the sheen. 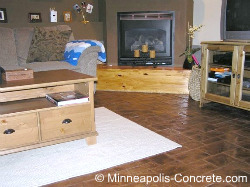 Heating Concrete - Many worry about how cold concrete feels, especially in climates like Minnesota. There are several options to counteract this. The most obvious is to heat the floor. It's best to install radiant heat when building the home along with floor insulation, but if the flooring is already installed, pour an overlay with heat pads in it. To keep costs low, forget the floor heating, and use area rugs. 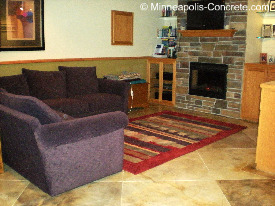 We personally did this in our own basement, and installed a fireplace. Our basement is now surprisingly much warmer in the winter than when we had carpet. 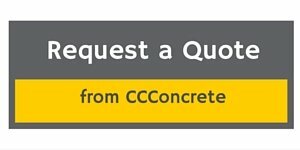 If you live in Minneapolis or the surrounding suburbs, request a free quote on your concrete flooring project.